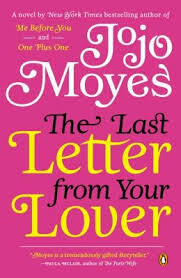 Jojo Moyes has reinforced my admiration of her work with The Last Letter from Your Lover. Published in 2010, this fictional novel took a long time to capture my interest, but in the end, I came to like it a great deal. This was a slow-going read for me. If you find it the same way, keep with it as the end justifies the wait. The story is about a woman in England who awakes with amnesia caused by an automobile accident. Everyone around her, including her wealthy husband, are strangers. Not long after the accident, a confused Jennifer discovers a handwritten love letter hidden among her things signed only with the letter “B”. The letter can’t be from her husband whose name is Laurence. So begins her search for a mysterious great love she cannot recollect. The novel switches back and forth in time quite a bit. This I didn’t enjoy. However, as I said earlier, the end of the novel justifies the path taken to get there. If you are already familiar with Moyes’s work, I think you will enjoy this one as well. This entry was posted in Uncategorized and tagged amnesia, Books, England, fiction, Jojo Moyes, love letters. Bookmark the permalink.